Mark your calendars: Sunday, April 22nd from 12:00-4:00. No appointments – first come, first served! It is on a 1st come, 1st served basis! Last year, we had girls lined up starting around 9am. We’ll open the doors at 12:00 and will come out and grab everyone’s information prior to the sale. We have 6 dresses rooms so there will be 6 brides trying on dresses at a time! 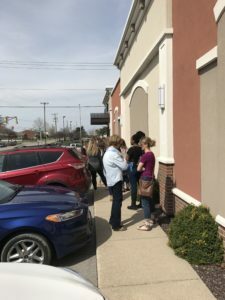 If you are only looking at accessories and don’t need access to the dressing rooms, you don’t have to wait in the “bridal” line when the doors open. I’ll still take your information but you can come on in and start browsing around! We will have a Pinterest page where you’ll be able to pre-shop the sale and will let you know as soon as it goes live! There will be a 5 dress limit in the dressing room. You’re can bring in 5 dresses and as you release 1 back to us, you can grab another dress! You get 45 minutes in the dressing room. The 45 minutes starts when you actual go into the dressing room to start trying on dresses, not when you start looking through the dresses. All sales are final and the item has to be paid for in full (minus #9 below)! The great thing about this Super Sample Sale is you’re going to get some great deals on dresses and accessories, but that does come with a couple of stipulations, the fact that all sales are final and payment is due in full at time of purchase being two of them! We are offering 2 different packages this year! For $40 we will store the dress in our boutique for you until your wedding! The 2nd package, is that for $75 we will spot clean and repair minor wears and tears for you! Minor wears and tears include replacing missing beads, stitching tears in tulle, replacing buttons, etc. We also will only spot clean. We don’t actually recommend getting your dress professionally cleaned before your wedding. We are also offering a payment package for dresses over $1,000! Items under $1,000 have to be paid for in full at checkout but if you’re dress is over $1,000 you have the option to pay a 75% of it at the SSS and then the remaining balance within 60 days! There is a $20 fee to do the delayed payment but this is an option for those dresses above $1,000. Most of the dresses are sizes 12 and 14. We will have around 5 plus size dresses in sizes 20-24, however! Lastly, only cash or credit cards will be accepted! Keep in mind these are sample dresses! Some light wear and tear is to be expected but the prices will be adjusted to reflect that! If you have questions, never hesitate to let us know! What is our Essense Sneak Peek Trunk Show? Take a selfie at One Fine Day, win a Target gift card!